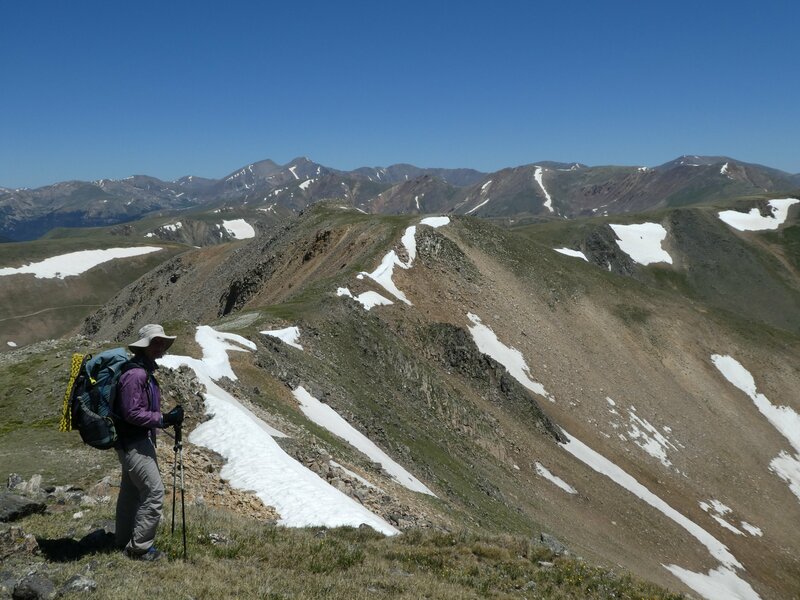 This section really has been Colorado hiking at its best! 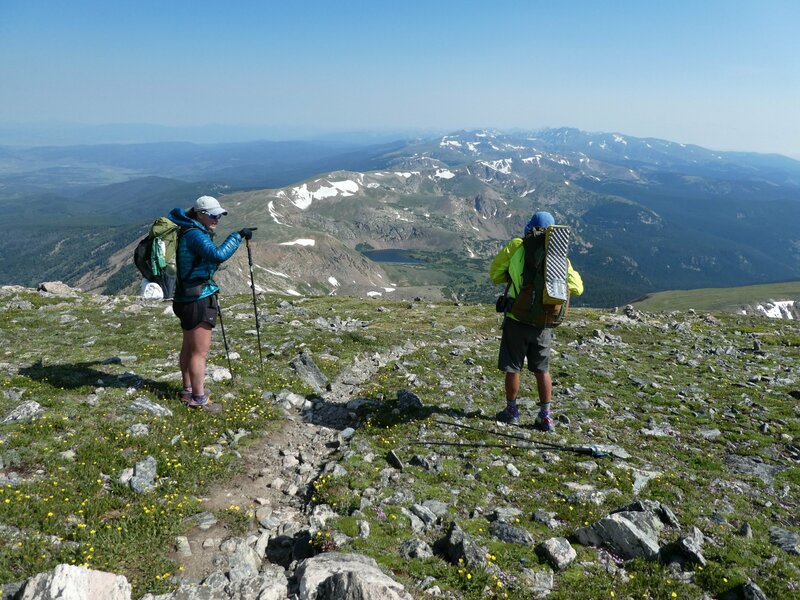 Following high mountain ridges, climbing some of its highest peaks, long days spent above the treeline – it’s been challenging, but we expected nothing less when we set out on this trail. Our first half day out from Breckenridge was unexceptional. After running the gauntlet of wind-up merchants on the free local bus (topics covered – the royal wedding, Prince Harry’s parentage, Brexit, and of course Donald Trump) we got back onto the trail, where we dodged mountain bikers flying downhill as we plodded up and over a high ridge. Looking for a campsite near to the Swan River, we were surrounded by other hikers – folks out for the weekend, holidaymakers and Colorado Trail hikers too. The Swan River was to be our last water source for 38 miles, so before turning in for the night we filled up all our water bottles ready for the morning, adding over 5kg to our rucksack weights. Setting off at 6am the next morning, our rucksacks felt very heavy as we climbed up to 11,795 feet, where we left the Colorado Trail and the treeline behind. 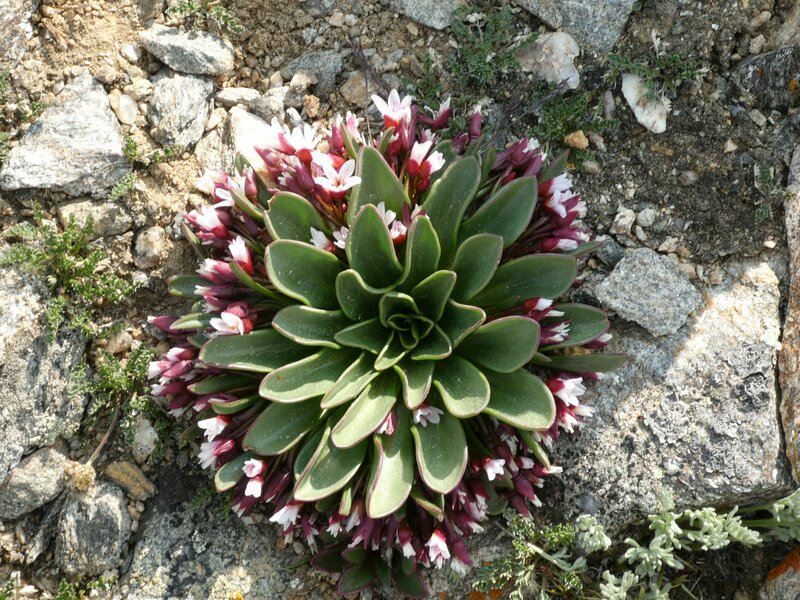 Following mountain ridges as they dipped and rose for mile after mile, it was hard going but offered magnificent views across the mountains, while closer at hand the grass was studded with millions of tiny alpine flowers. Sadly this area is marred by 4-wheel drive tracks, and the trail follows these tracks for quite long stretches. This made for horrible surfaces for walking on, and far too often we had to step aside to let vehicles go past, throwing up clouds of dust as they did so. 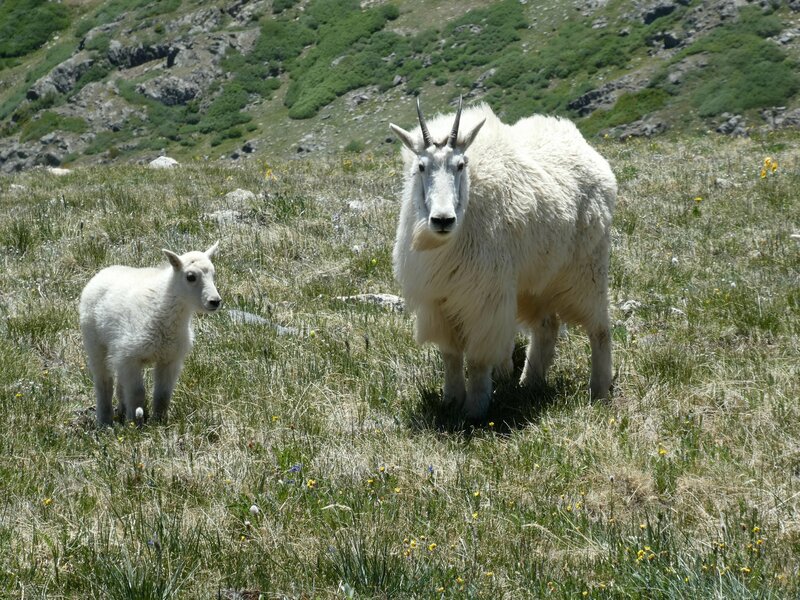 We found it odd that some mountains had signs at trailheads urging people to take care of the fragile mountain environment, stick to the paths and not trample the vegetation, while other mountains close by with the same flora had cars and ATVs parked on top! But once we got off the 4WD tracks, and back onto small paths or simply making our way across pathless saddles, we were much happier. 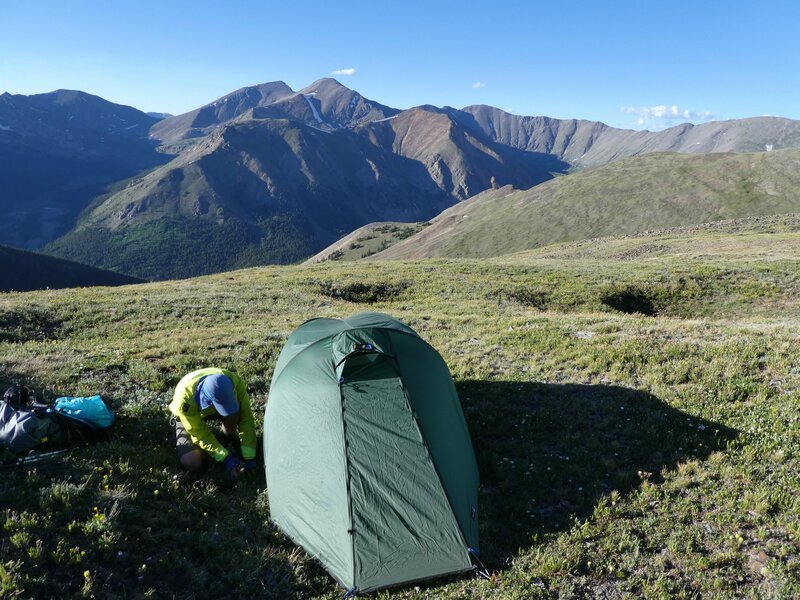 Our campsite at the end of a long and exhausting day was a small hollow in a hillside with a great view of our next day’s objective – the Argentine Spine and Gray’s Peak, at 14,255 feet the highest point on the CDT. After an early start in bitterly cold wind, we soon warmed up with two very steep ascents up onto the Argentine Spine. 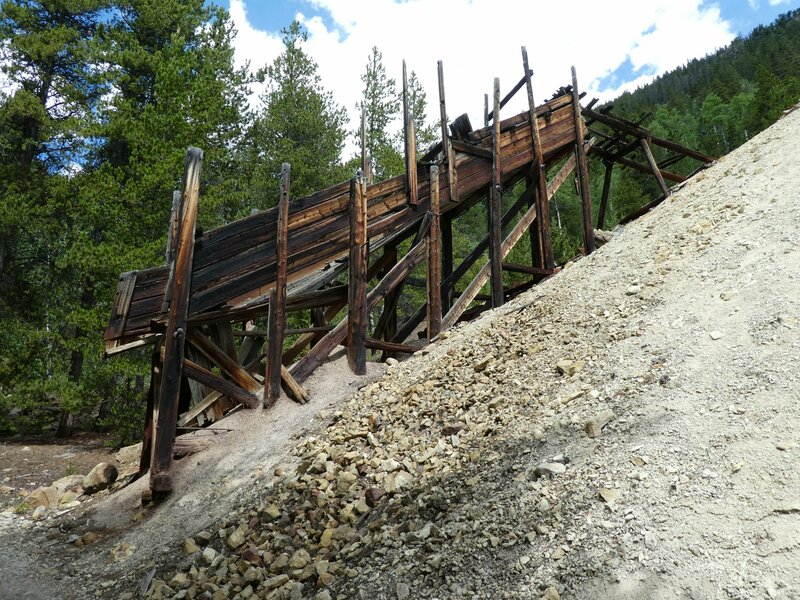 This mountain ridge was the scene of silver mining operations in the past, and as we traversed around a steep rocky hillside we were amazed to find the ruin of a miner’s cabin, right next to a collapsed mine entrance. I guess he must have been keen to protect his claim! 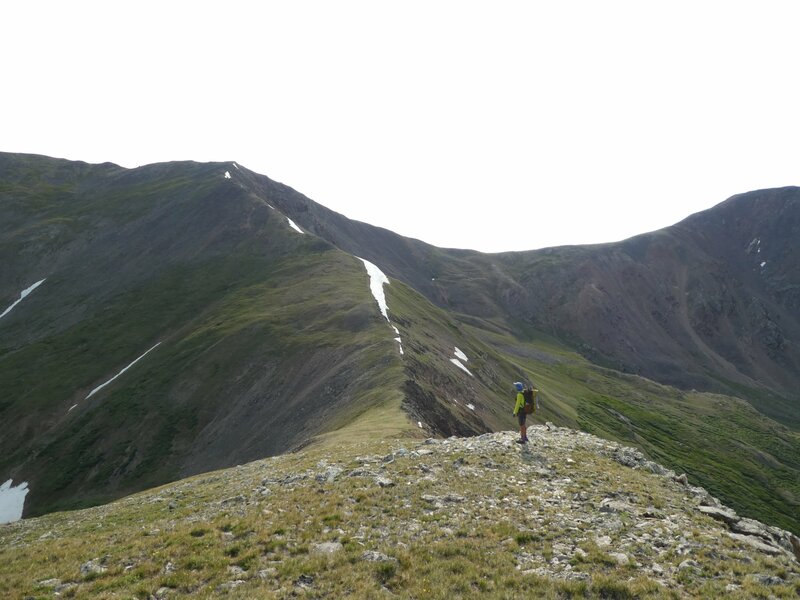 As we got closer to Gray’s Peak, we spotted a hiker coming towards us. This turned out to be Yoda, who we’d last seen at Randy’s place at Twin Lakes. 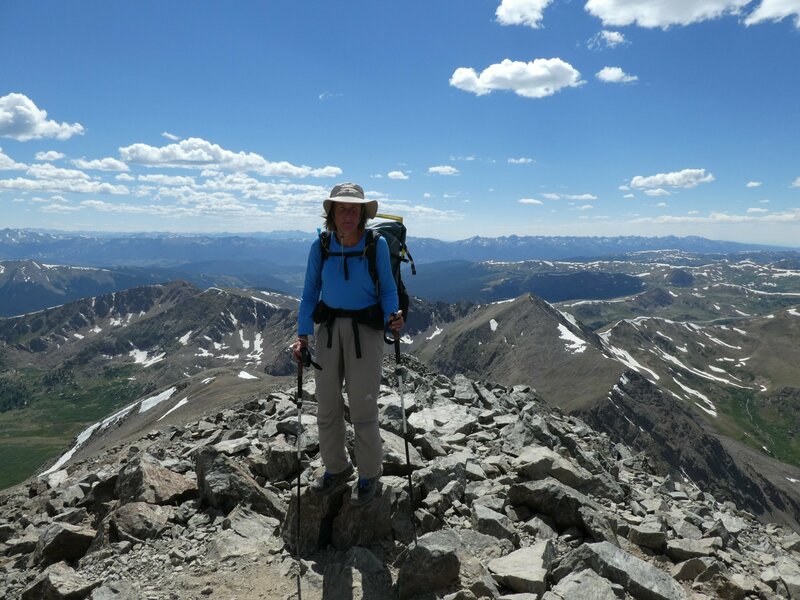 She’d taken a tumble on steep ground the previous day, and when she’d got to an exposed ridge leading to Gray’s Peak, with no obvious route across, she’d not had the confidence to go on and had turned around. So we teamed up and went to take a look. 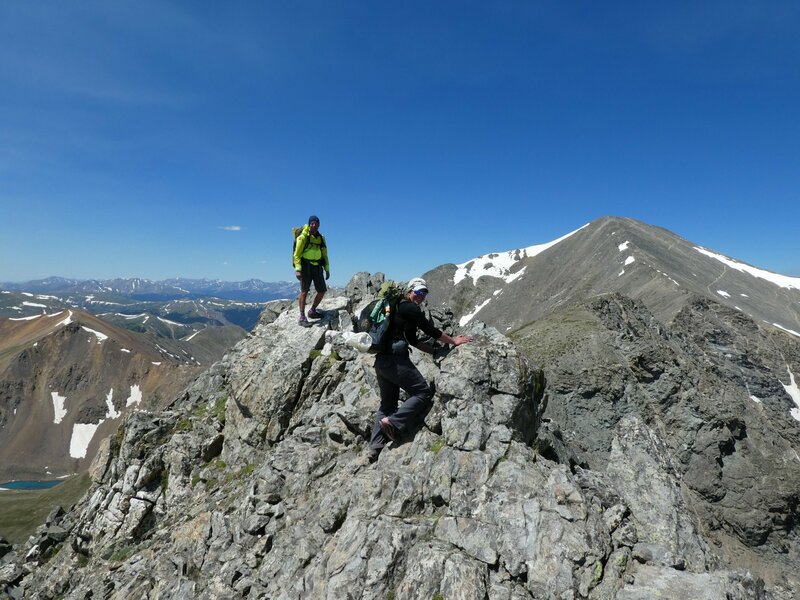 It certainly was very exposed, with massive drops to corries on both sides, but there was solid rock along the crest of the ridge which made for some pleasant scrambling, and Yoda soon got the hang of making her way carefully along. 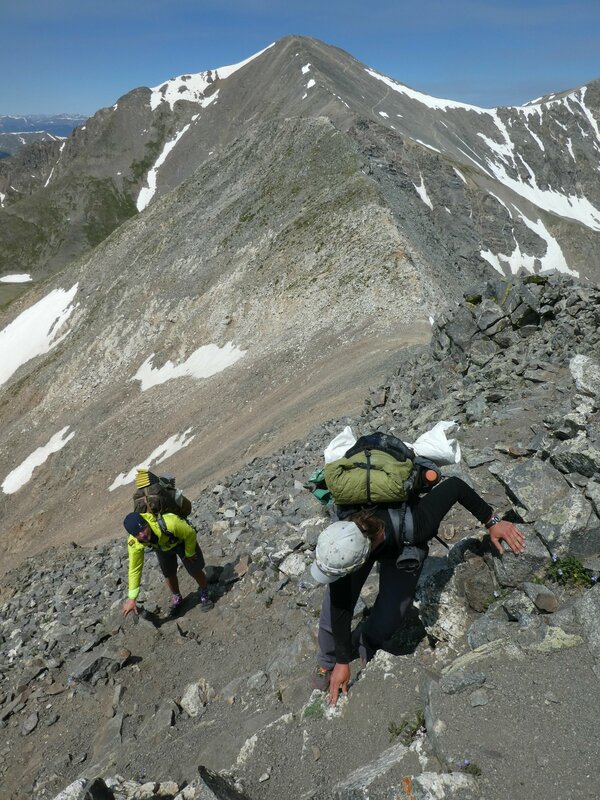 But when the crest of the ridge got too steep we were forced down the sides of the ridge, where we picked our way nervously across loose rocks and gravel while trying to ignore the huge drops below. It wasn’t particularly nice, and we were all amazed that a hiking trail would follow such an exposed route! 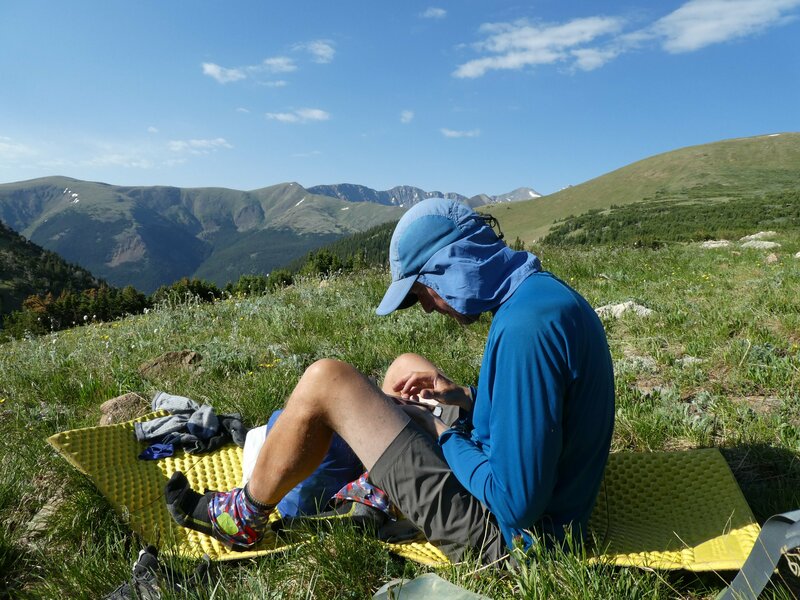 By the time we reached the broad rocky shoulder of Gray’s Peak, it was time to breathe a sigh of relief and enjoy some lunch. 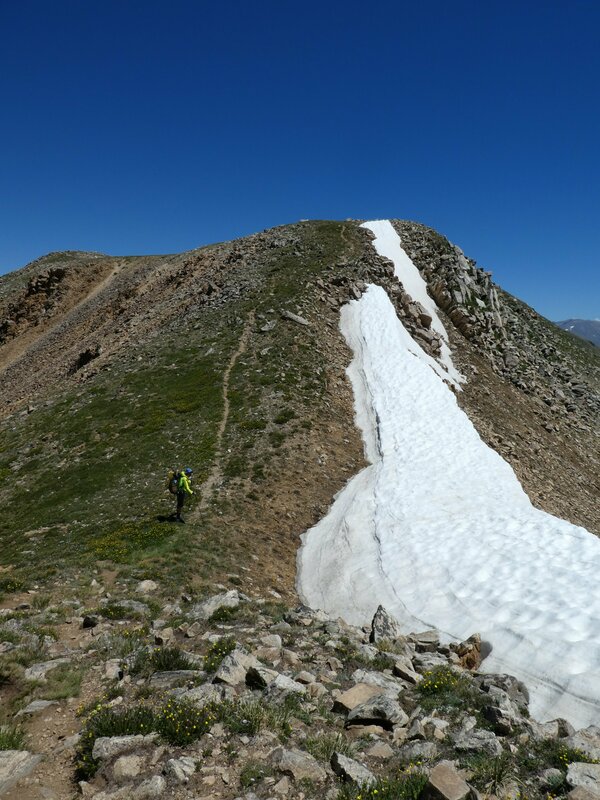 From there it was a steep climb up the tourist path to the busy top of Gray’s; then while Yoda went to get some water trickling from a snow patch, Neil and I quickly bagged the neighbouring peak of Torrey’s at 14,200 feet, before a long descent down into the heat of the valley. There we met up with Yoda and hitched out to Idaho Springs for showers, beer and pizza – a perfect end to a long but brilliant day. The next morning, after buying food for the next four days, we hitched back to the trail. Unfortunately, in our excitement at getting a lift into town the day before, we had failed to note at which junction on the interstate we had come off trail – so on our way back, we accidentally asked to be dropped off at the wrong junction! We hoped to hitch a ride on the back road which ran parallel to the interstate, but as the road seemed to be used only by cyclists we ended up walking 4 bonus miles on tarmac – not the best start! Then when we finally got back on trail, I checked my phone during a break and found an email from Yoda, asking if we had heard about a new trail closure up ahead. 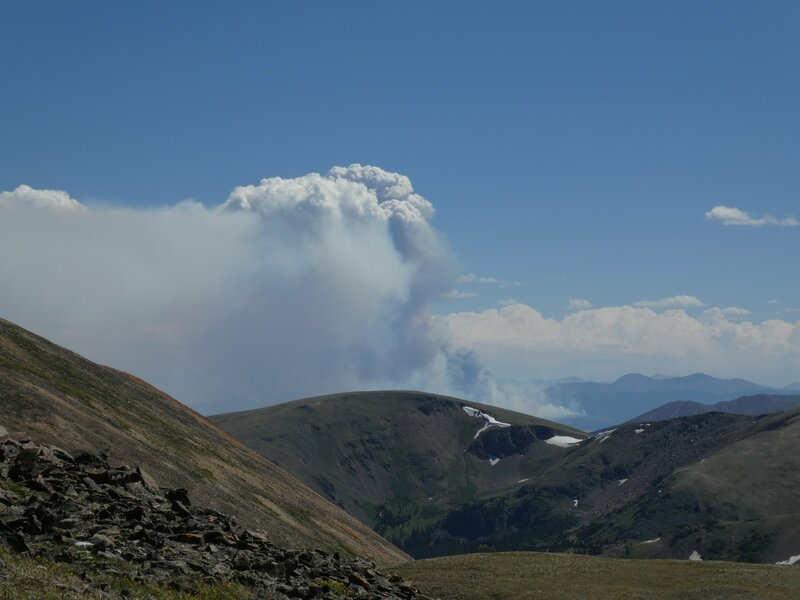 Oh no, not another one … This one was because of a wildfire in a catchment area close to the trail, and there was a suggested diversion. So we downloaded the maps and description, and headed off on the Bard Creek Trail instead. This turned out to be a surprisingly enjoyable little trail, which climbed steeply up above the interstate before traversing round at treeline level. Thunder was rumbling around the mountains as we walked on, but by the time we found a high meadow for camping, the weather was simply cold and grey. After a quick dinner of noodles, we were glad to get into the warmth of our tent. As usual the morning was clear and sunny, as we climbed over a saddle and followed a long valley down to the small town of Empire. 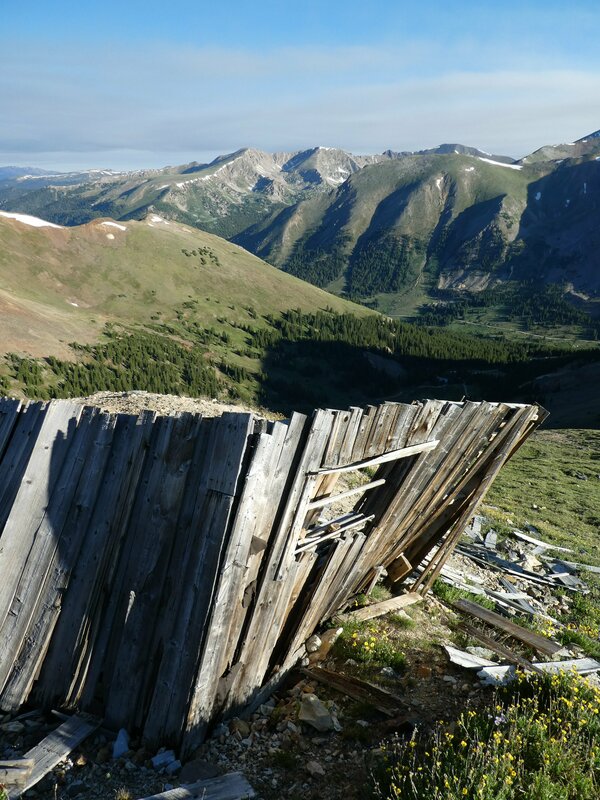 The upper valley was gorgeous, with lush meadows, and a few ruined cabins and abandoned mines. Further down, the path turned into another wretched 4WD track, hard on the soul and hard on the feet, but spirits revived when we got to Empire and settled into a small but frantically busy cafe to enjoy an unexpected treat of burgers and fries and malt shakes. 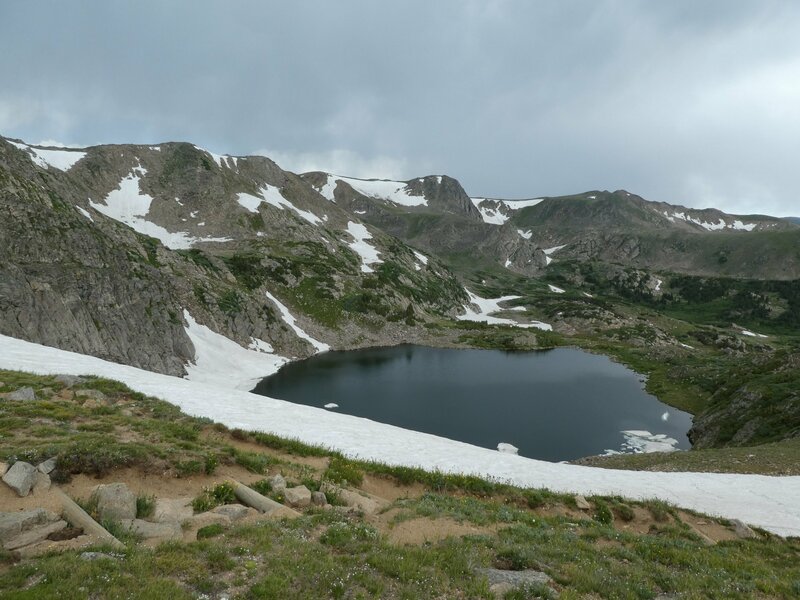 Feeling utterly stuffed, we headed off up a steep uphill on all-too-familiar 4 wheel drive tracks, up to the poetically named Bill Moore Lake where we rejoined the CDT, following a well built trail before catching up with Yoda and Caspar camped in the valley bottom. The next day started as so many have done recently, with a big climb first thing to get us properly warmed up after a chilly night. 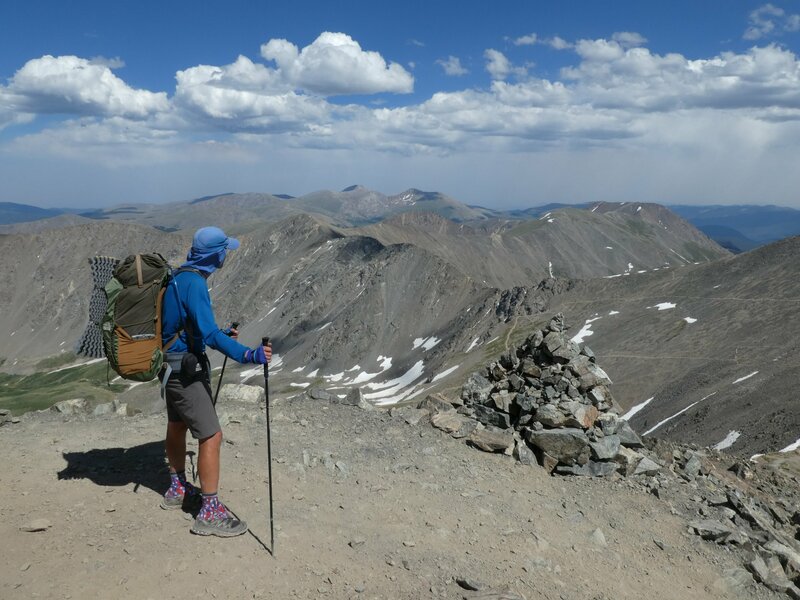 By 9am we were sitting on top of James Peak (13,310 feet) with Yoda and a family of marmots, enjoying a second breakfast in the sunshine, huddled down in the summit shelter to stay out of the cold wind. From there the only way was down, and while Yoda opted to drop down to a road, Neil and I followed a ridge down to Rawlins Pass. 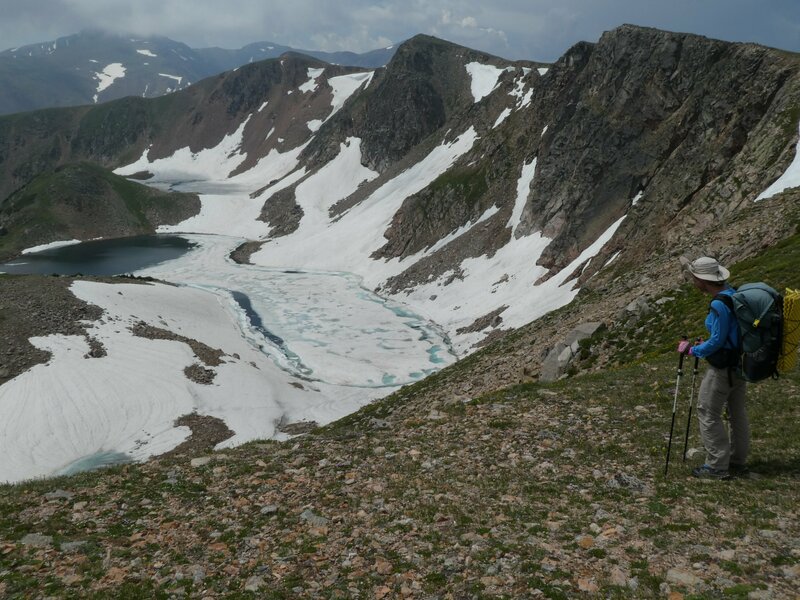 It was all cross country on boulders and rough grass, so it was tough on the feet, but the views to the east of the ridge, down into rocky corries with iced-over tarns, made the effort worthwhile. 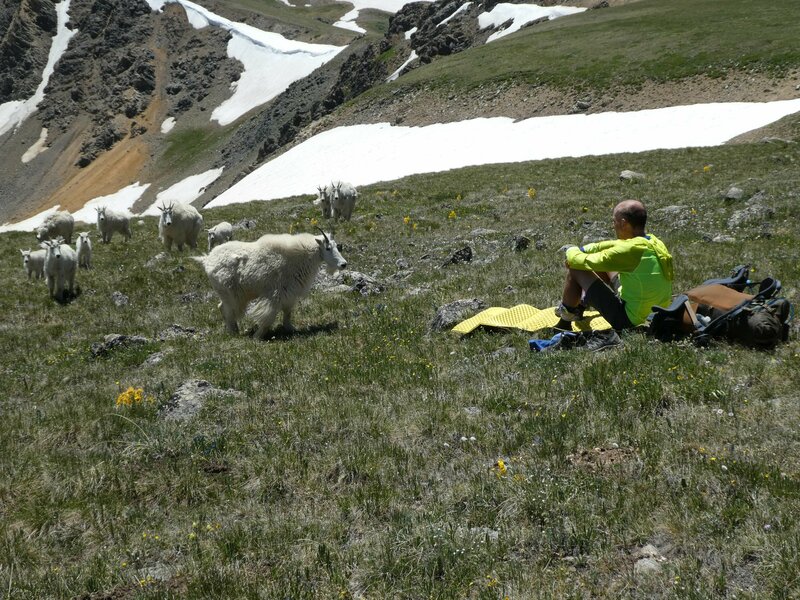 We caught up with Yoda and Caspar at the pass, and waited for a thunderstorm to go by before continuing along the ridge. Yoda, being a fast hiker, was way out in front, but then suddenly she wasn’t. Coming over the brow of a hill we found her sitting on the path, nursing a big gash in her knee. 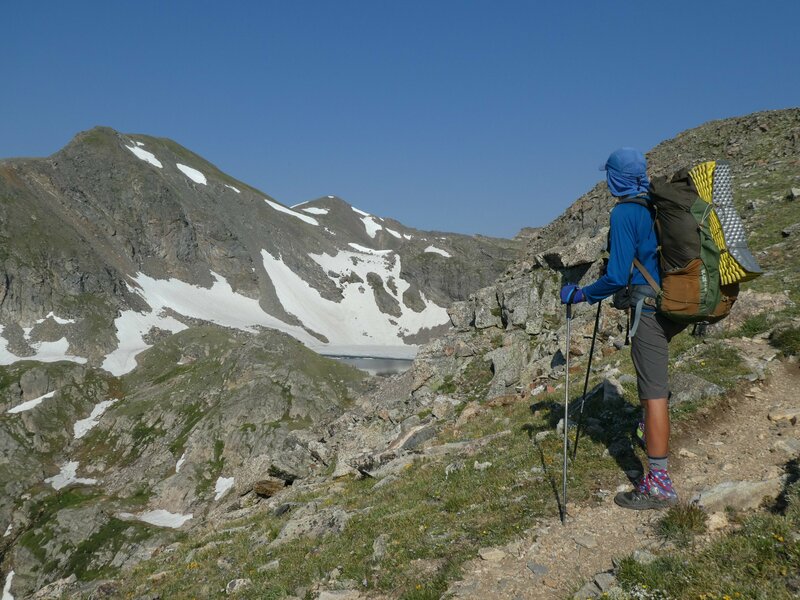 A trip over one rock on the path, and she’d crashed down onto another pointy rock with the full weight of her pack on her back, making an impressively deep and nasty looking hole in her knee. 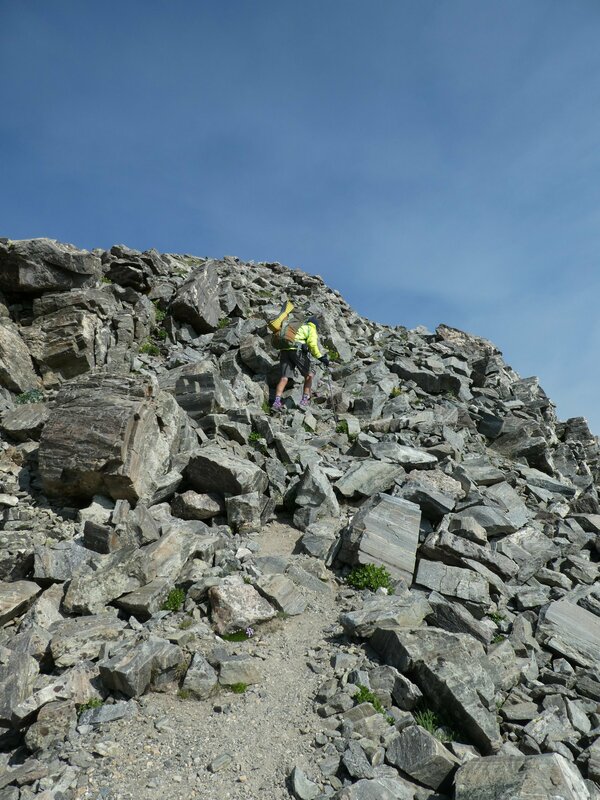 We helped as best we could, with iodine, tape and ibuprofen, but hats off to Yoda – she braved her way up another ascent and a really long steep and rough descent, which were tough enough even with uninjured knees! 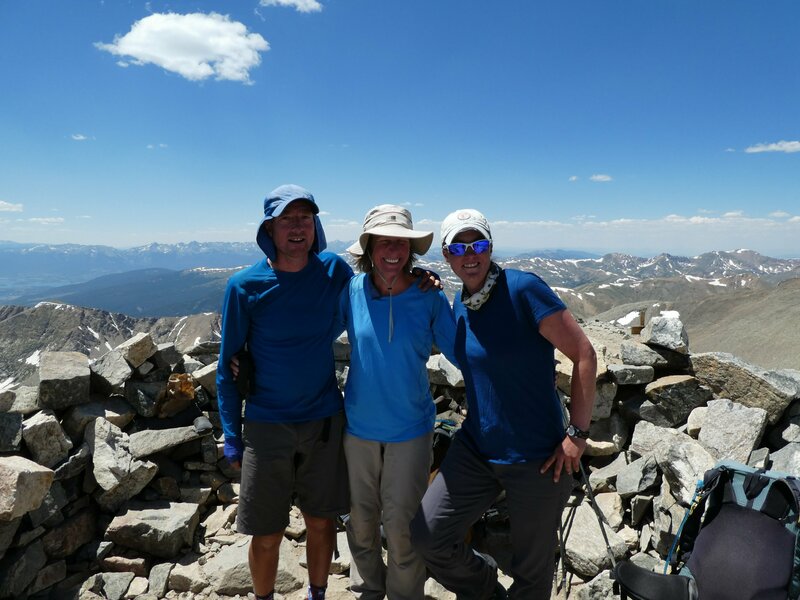 Fortunately the next day was easier, with a well graded descent to Monarch Lake trailhead, where Yoda got a lift to town with Caspar’s parents to get medical attention, while Neil and I hiked on to Grand Lake (avoiding some angry moose stares – scary!) to enjoy a rest day and to resupply. 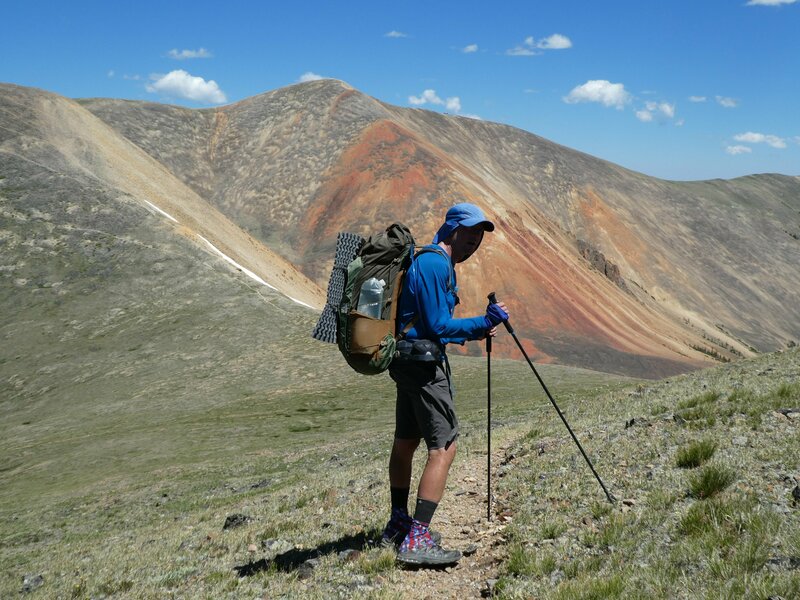 We think we are now about half way through our hike; certainly we are getting towards the end of Colorado, and the end of the big mountains for now. 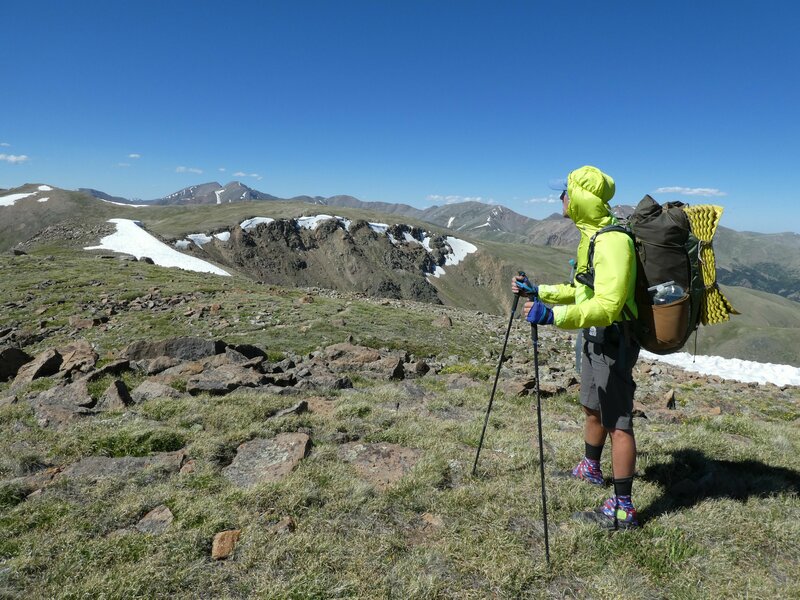 We are starting to look ahead to our next big challenge, the Great Divide Basin – a hot, dry, waterless stretch that I’m really not sure I’m looking forward to! 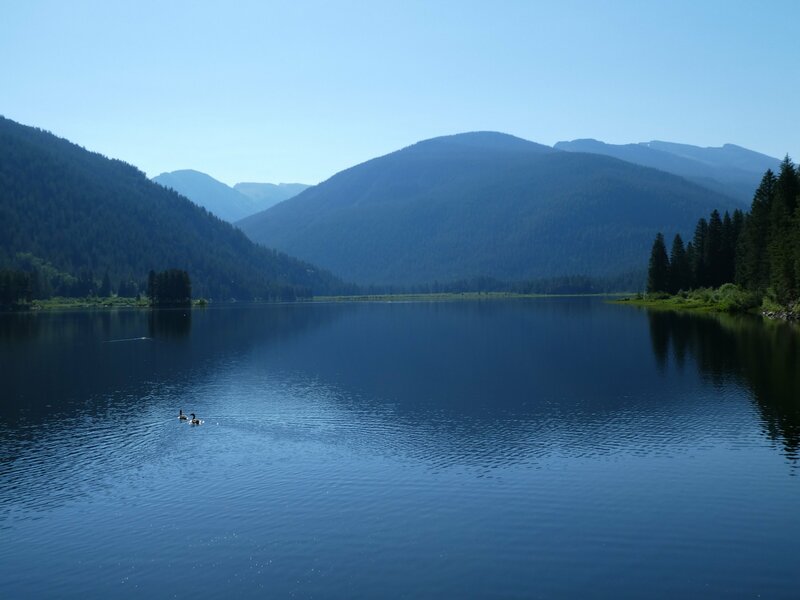 I think we’ll miss the big mountains that we’ve enjoyed so much over the last month, and the nice cool temperatures and big views that come with higher elevations. Not to mention the marmots! 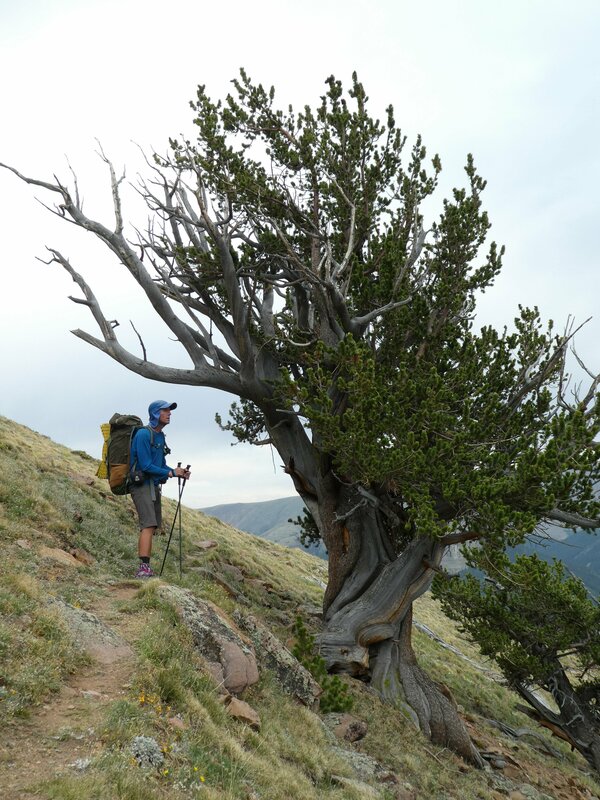 A fantastic section, hard hiking, but very rewarding. 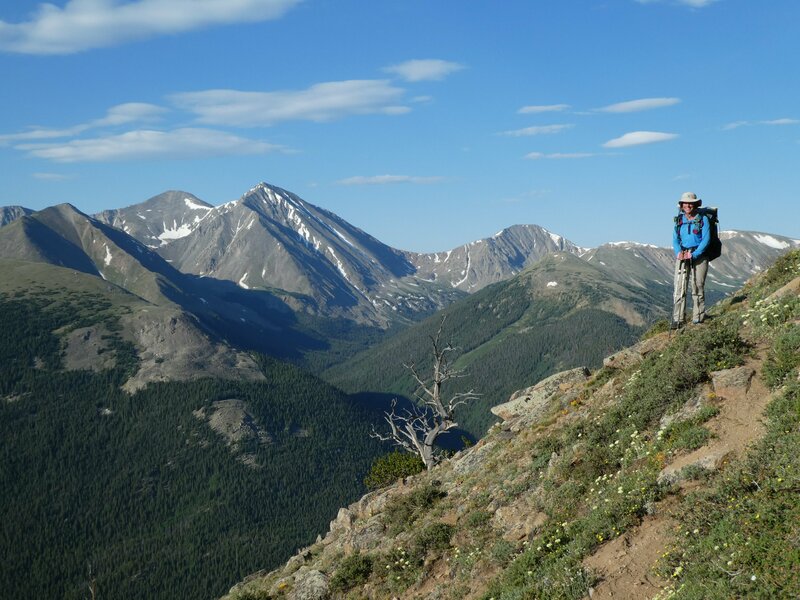 I camped on the northern side of James Peak, it was brilliant watching the sunset and then the sunrise. Great admiration for what you have achieved so far – what an amazing experience!